Basic Information: What are Now Foods Glucosamine and MSM Supplement Capsules? 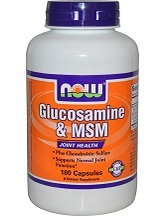 This review tackles the product known as Now Foods Glucosamine and MSM. This dietary supplement aims to provide the essential nutrients to help offer relief from pain caused by joint problems such as arthritis. This all natural supplement is also developed to be completely approved by vegans. Please continue reading our full review below. This is a dietary supplement and is taken as such. The recommended dosage for this product is two capsules per day. You can take it anytime you want and are promoted to be taken with meals or with an empty stomach. This is perfectly safe to digest and will not cause any undue stomachaches. This product is available for $13.19 per bottle. One bottle will contain about 120 capsules and should last you a month. As of the moment there are no discounts available or any sort of monthly supply package promos. This product can be purchased directly from their official website but it is also available through various reputable online stores. We discovered that while the label states you can take this supplement with an empty stomach this is in fact false. There are several complaints of this supplement causing nausea when taken without having to eat anything. To prevent this side effect we recommend that you take this product alongside a meal. We also learned that while it does help relieve pain caused by arthritis, the compound used in this supplement does not in fact help build up your joint and cartilage integrity. There are no guarantees attached with this particular product. We could also not find any sort of return policy on their official website. However, we do have to note that this supplement has a good standing with online customers with a solid review overall. In conclusion, the Now Foods Glucosamine and MSM Supplement is a nice choice for those looking for a budget joint pain reliever. It is quite affordable and is effective in delivering a soothing release from arthritis pain. However, we have to note that this is a mere temporary remedy only. Unlike other products in the market, this one does not help build up your joint and cartilage condition which means the condition will return later on. As a quick fix to alleviate the pain this one is highly recommended but it will not be enough for a permanent cure.